Daily Survival: Water, water everywhere and…. not a drop to drink. Do not. Do not. Do not be caught thirsty. You will die. Then I will take your stuff from your dead body. If I have enough energy I may try to bury you properly and say a little something about ashes and dust. Although I live in the northeast with gobs of people, we are fortunate to have copious amounts of water. If you are caught in the wrong climate without water you can be dead in less then 24 hours. Drinking water and rehydrating is just as important in the winter as in the summer. You know that breath you see coming out of your mouth when it’s cold out? That’s water that you are giving up with every single breath. You may not sweat in the cold, but make no mistake about it, you can become dehydrated just as easily. You have to keep drinking. The rule is to drink before you get thirsty. If you wait till you’re thirsty, you are already dehydrated. Because water is our lifeblood I have multiple ways to clean and store water. This is one area that you need redundancy. I like guns too, but water is more critical than firearms. In my humble opinion you shouldn’t be doing the 1,000 round, AR, AK, bandolier, sardine can, 50 extra mag, $500 scope thing until you have multiple ways to procure potable water. There is a difference between water filters and water purifiers. Water filters usually get down to maybe 2 microns but they don’t remove the very small viruses. Purifiers are certified by the EPA to remove just about everything. If you filter only then you may also need to boil or add chemicals to kill the under 2 micron viruses. It doesn’t matter what you have the filter/purifier element needs to be replaced or flushed every once in a while. So before you buy figure out how long they last for and how much the elements are to replace. Some filter elements can be washed clean by backflushing which is cheaper than having to replace them so pay attention to whether the one you want to by can be cleaned in the field by backflushing or whether you’ll need to by a brand new element every time. You can extend the life of your filter elements by pre-filtering or straining dirty water through a bandana or filling some container first and allowing the dirt to sink to the bottom of the container before you send it through your filter. There are table top filters like Katadyn Drip Filter and the Big Berkey. Although I haven’t used either they both seem like good filters for long term use. A lot of folks seem to like them and they have been proven. I expect to be able to bug in and remain on municipal water so I don’t see the need personally for one of these. These would be heavy to carry on your back, great for cabins though. Good thing is because these are gravity fed there is no pumping involved. For more portability folks seem to really like the Katadyn filters. They come in a large variety of models to meet all applications. You really can’t go wrong getting a Katadyn filter. They’re being used by armies around the world. These need pumping. I go camping and like to have back ups in case I need to bug out. Because of that I like the First Need XL water purifier. It’s small so it fits in my pack no problem. Because it’s a purifier certified by the EPA it removes enough of everything so I don’t need to take any extra steps after pumping water through my First Need. Be sure to keep some extra filter elements on hand. Gotta pump these too. 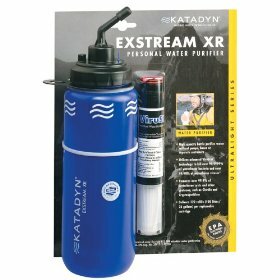 For hiking and day trips I like Katdyn Microfilter. It’s actually a purifier not a filter, so it gets everything out. As you can see it looks like a simple water bottle. It fits in the cage of my mountain bike that holds a water bottle. Simple to use - fill it and squeeze it. Great for traveling light or maybe your BOB or GHB (no not the drug, your Get Home Bag). Next up I like these little Survival Straws. They have some sort of alloy in the filter elements which is also supposed to kill viruses so they’re classified, despite their diminutive size, as a purifier. They’re a little pricey at $20-$25, but they are very small. I have one of these in my GHB that would allow me to drink right out of a puddle if need be. Here is a similar purifying unit that is approved by NATO. This one is called the Water Purifying Straw. 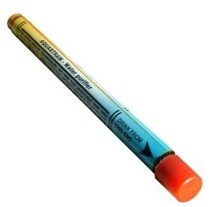 At 16 bucks it’s cheaper than the Survival Straw, but I haven’t used it so for once I have no opinion. Although I don’t have one I also like the concept of the Katadyn Base Camp filter. You fill it and hang it from a tree and it just drips clean water for you. No pumping! They’re supposedly rated for 5,000 gallons so it should last a long time. They cost about $65. Seems like they would fold up pretty small too. Again great for bugging out, canoeing or camping with a crowd. Another purifer that I like is the Pur Scout. This is another unit that’s made for backpacking. Here’s a good review of the product. In addition to using mechanical means to clean water you can also use chemicals. If you use a filter and not a purifier you may want to add chemical depending on the risk that the water is contaminated. I think you need to worry more about viruses in populated areas than the true woods. There are different chemicals that can be used: iodine tablets, chlorine based chemicals and oxidizers. We’ve all seen these iodine tablets. The good thing is that they’re cheap and don’t take up much space. The bad thing is that they make the water taste like crap. 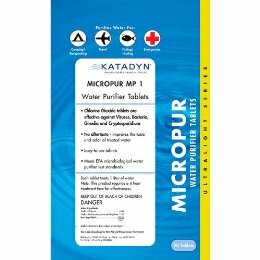 There are also tablets available that are made from chlorine that will kill the buggies, tablets that are oxidizers that kill the buggers and Katadyn now makes a product that is in tablet form that kills bacteria, protozoa and viruses and doesn’t leave the water tasting like crap. There is now a UV light that is available that is supposed to kill everything in the water. It takes batteries. You stick the probe into a container of water and the light kills the buggies. I’m not sure I like this because it doesn’t filter out any of the impurities, so you’ll still be drinking muddy water except there won’t be anything living in it. You can also use straight unscented bleach to clean water. The ratio is eight drops to a gallon of water. If the water is dirty, pre-filter it or let it settle than decant off the cleaner water before adding your bleach. Add your bleach, stir and wait a while. If it doesn’t smell like chlorine add a few more drops and wait a while longer. Repeat as necessary. Good info from the EPA here with some downloadable PDFs for keeping. Over time bleach loses its effectiveness so you need to rotate your bleach, or if it’s old add a few more drops than you would for fresh bleach. 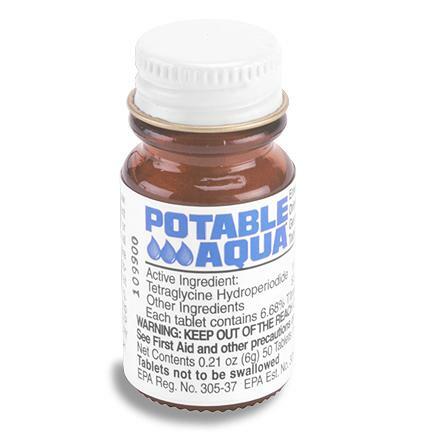 Powdered clorine lasts much longer and is much more concentrated than liquid bleach so a bag or two of pool shock would be good to keep around the house, but it has to be diluted much more than the liquid bleach. You can also boil your water. I’d boil at a roll for a minimum of three minutes. Boiled water tastes flat so to improve the taste you can aerate it by pouring it from container to container like a bartender. You gotta make sure that your containers are clean otherwise you’ll be recontaminating your clean boiled water. If you have a trash bag or plastic sheeting like you should, you can also distill water a bunch of ways from filling a trash bag with non-posionous foliage to make a transpiration or vegetation bag. Great explanation of both. The basic concept is that just as we breath out moisture with every breath so don’t plants. When you traps foliage in a bag the moisture that the leaves give off will collect in the bottom of the bag. As long as you use non-poisonous plant matter the water will be safe to drink. or you can build a solar still. Depending on your situation it’s a good idea to have some water stored too. Just like with your preps of food you have to rotate your water. I tend to rotate my water every three months or so. As I said up above we have gobs of water everywhere so I’m not too concerned about storage of water. I do have around 20 gallons stored, but this is more so that I can bug out quickly if need be. So if we need to evacuate for some reason I can throw my few large containers in the car, have enough drinking water for two weeks and be gone in minutes. You don’t want to be putzing around filling containers when you should be hitting the road. Do it now. Please make sure to go to the bathroom away from water supplies and bury your waste deep. 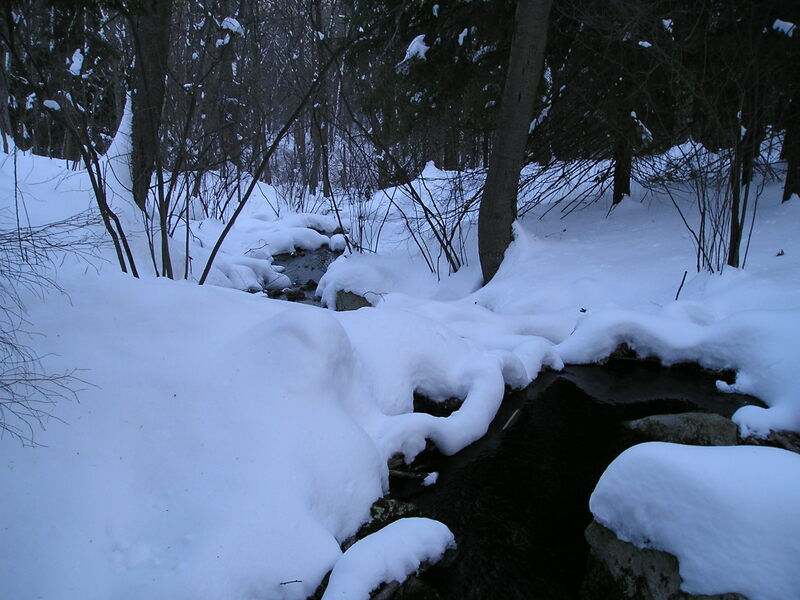 Just a snowy day in snowy woods with a snowy stream. You can see how much water we have everywhere.